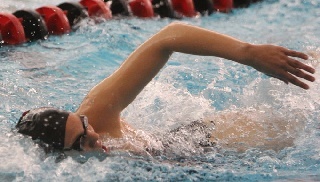 Madison Aranda, Viktoria Orosz and Ashley Dow combined to win seven events as the YSU swimming and diving team defeated Saint Francis 158-125 on Saturday afternoon at the Beeghly Natatorium. Orosz led the squad with three first-place finishes in freestyle events. The freshman sensation won the 200-yard freestyle in a time of 1:53.66. She later took first in the 100 free with a time of 53.10 seconds and concluded a strong meet with a time of 5:05.29 in the 500 free. She won the 500 by nearly seven seconds, took first in the 200 by 2.33 seconds and claimed the victory in the 100 by 2.28 seconds. Aranda won the 1,000-yard freestyle with a time of 10:36.70 and took first in the 200-yard butterfly clocking in at 2:09.30. She was impressive in the 1,000 taking first place by 51 seconds. In the 200 fly she was first by 3.47. Additionally she was second in the 400-yard IM at 4:39.36. Dow earned first-place finishes in the 100-yard back at 59.07 seconds and the 200 back at 2:12.26. She was first in the 100 by 2:23 seconds and won the 200 by 8.44 seconds. She was also second in the 100 butterfly at 1:00.18. The meet started with a rarity as the YSU divers competed in the platform for the first time at the Beeghly Natatorium. Lydia Scheringer, Megan Siford and Bethany Glick all took part in the event. Scheringer won with a score of 204.00 and attempted one dive from the 10-meter platform. Glick had a 168.85 while Siford had a 139.10. In the one-meter dive, McKenzie Stelter had a strong all-around performance winning with a score of 254.95. Other top finishes for YSU included: a two-three finish in the 200 breaststroke as Kolbrun Jonsdottir was second with a time of 1:07.79 and Hannah Reynolds was third at 1:08.63. Rachel Shipp was second in the 200 butterfly behind Aranda with a time of 2:12.77. Jonsdottir had a second-place finish in the 50 freestyle at 25.00 seconds and was second in the 200 breast at 2:29.12. Jana Janson came in second in the 100 free with a time of 55.28 seconds and Chelsea Malone was second in the 200 back at 2:20.66. The Penguins conclude the dual portion of their 2015 schedule next Friday when they play host to Bowling Green.